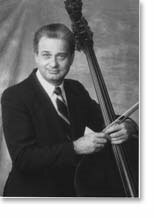 Lawrence Hurst began his professional career as a principal bassist with the Dallas Symphony Orchestra under Sir Georg Solti. He returned to his alma mater, the University of Michigan, in 1964, where he began a long and distinguished career as performer, clinician, and pedagogue. His students may be found in numerous orchestras, some of which are the Chicago, Philadelphia, San Francisco, St. Paul Chamber, Atlanta, Indianapolis, and Pittsburgh in the United States; Calgary, Winnipeg, and Ottawa in Canada; and in Puerto Rico, Greece, Hong Kong, Israel, Spain, and Germany. He has given workshops and master classes throughout the United States and Canada, Costa Rica, Beijing, Hong Kong, and Christchurch, New Zealand. He has taught at Southern Methodist University in Dallas, Texas, Eastern Michigan University, and the Interlochen Arts Academy, Interlochen, Michigan. For many summers he has been on the faculty of the Interlochen Arts Camp (formerly the National Music Camp). He has served with the National Orchestral Institute as double bass coach at the University of Maryland, and has been engaged by the New World Symphony, Miami Beach, Florida, to give master classes for the orchestra's bass section. In 1991 he was on the panel of the Munich International Double Bass Competition. He is past president of the International Society of Bassists. In 1995, he was artist-in-residence at the inaugural session of the International Distinguished Music Alumnus award from the University of Michigan School of music. A gifted administrator, Hurst was an associate dean and chair of the string department at the University of Michigan School of Music. He also was a member of the National Endowment for the Arts scholarship panel, director of the University of Michigan Division of the National Music Camp, and chair of the American String Teachers Association National Solo Competition from 1986-92. Since 1986, Hurst has been Professor of Music, and chair of the String Department at Indiana University School of Music. In 2005 he was given the Artist/Teacher Award for that year by the American String Teacher's Association, and the following year the Distinguished Teaching Award by the International Society of Bassists. In 2007 Contrabass Conversations conducted an interview with Lawrence Hurst. Below you will find the complete list of scores edited by Lawrence Hurst.